So you guys remember just a couple of months ago when I was singing California's praises on its perfectly warm and breezy weather? Yeah....so about that. It has gotten hot. Like tank top and daisy dukes hot. On any given afternoon day, it's a solid 77 degrees. Yes, I realize that sounds like heaven to many of you. But I swear...the California sun is 100 times more intense than Florida's. Don't shake your head at me. It's true. I took a Meteorology class in college so I know this stuff. I promise I'm not complaining. I still adore my new home for 1,000 reasons and more. And as far as the weather is concerned, well...at least it cools down to a refreshing 65 degrees at night. That's just one of the simple pleasures that keeps me smiling, feeling ever so grateful...each and every day. When the weather is hot, I feel like a bowl of fruit is a must. I vividly remember my mom devouring peaches and blueberries throughout the sweet summertime. She'd top off her cereal with the mixture or just happily eat it as is. But since I didn't love blueberries as a young gal, and since I'm allergic to peaches (one of the milder allergens of all 50+ fruits and nuts I can't consume), she'd always slice up strawberries me. I must mention, she's been the only person in my life who could remember every single fruit and nut that I'm allergic to. Gosh I miss even those little amazing things about her. Last week, remembering how pretty blueberries and peaches look as a pair, I decided to come up with my own concoction. But I knew I'd have to grill the peaches since cooking certain fruits chemically changes them in a way that makes 'em suitable for yours truly. Crazy, I know. Feta went in the mix because I wanted to be daring. 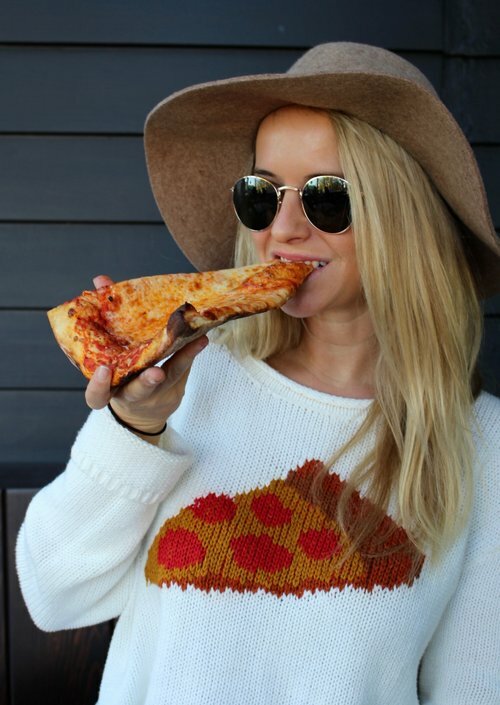 Also, cheese makes everything better. Mint showed up to the party too with its refreshing bite. And the whole mixture was all topped off with a sweet and tangy balsamic glaze. This little summertime snack was all that I had hoped for and more. It's easy, it's healthy, and it's the perfect hot weather treat. 1) Cut the peaches in halves. Remove the seeds. 2) Heat 1 tablespoon olive oil in a grill pan (or grill directly on outdoor grill with some cooking spray). When heated, place the fruit, flesh side down and grill for 3-4 minutes, until just slightly caramelized. Then, grill skin side down for 1-2 minutes. Remove from heat and set aside. Let cool for a few minutes and then cut in wedges. 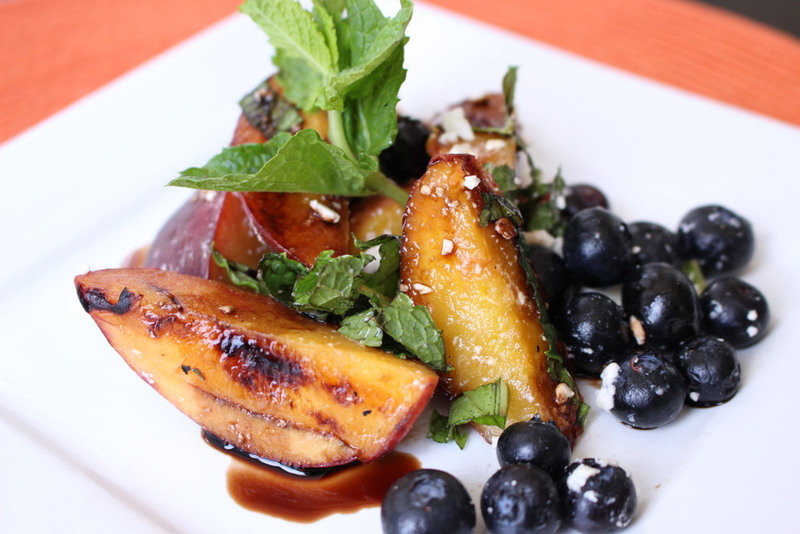 3) In a medium sized bowl, combine peaches, blueberries, feta cheese, and mint. Toss in 1 tablespoon olive oil and 1 teaspoon salt. 5) Plate fruit salad and drizzle reduced balsamic on top.